Where To Eat In Thailand. What to know before you go. Blog updated on March 19, 2019 4 Comments Any post on this site may contain affiliate links. If you use them they cost you no extra. We make a small commission. Thailand is bursting with food, everywhere you look you’ll see something cooking and options and styles are endless. 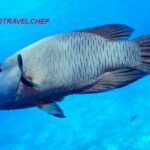 Deciding where to eat in Thailand is a pleasure, never a headache and the choice must be based on how much you’d like to spend and personal taste. Thailand has all types of food on offer, from top end hotels and restaurants serving gourmet Thai and Western dishes to the mom and pop stall on the side of the road. Its all here and easily accessible. 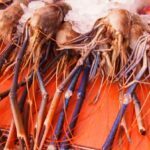 Bigger cities like Bangkok and Chiang Mai offer the best range at the top end, as you’d imagine, but everywhere you go you’ll find it easy and affordable to eat well. Even if your tastes don’t stretch beyond burger and fries, you’ll find all the usual fast food and coffee outlets here. 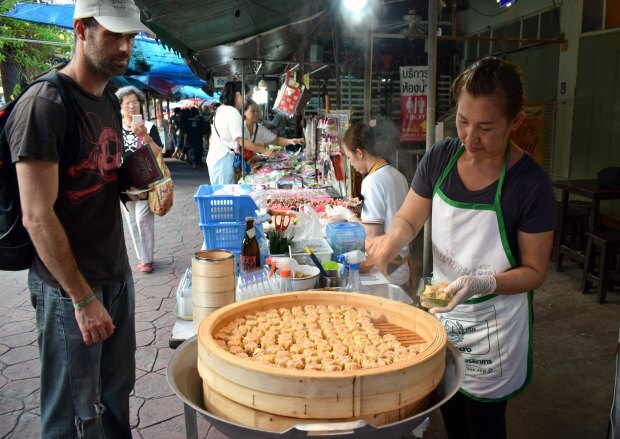 Heading into the countryside, away from the tourists, or exploring the streets and markets of small towns is really where to find what the locals eat. This would be my pick if you were to ask me where to eat in Thailand, but if Asian food isn’t for you, every tourist destination will still feed you well. 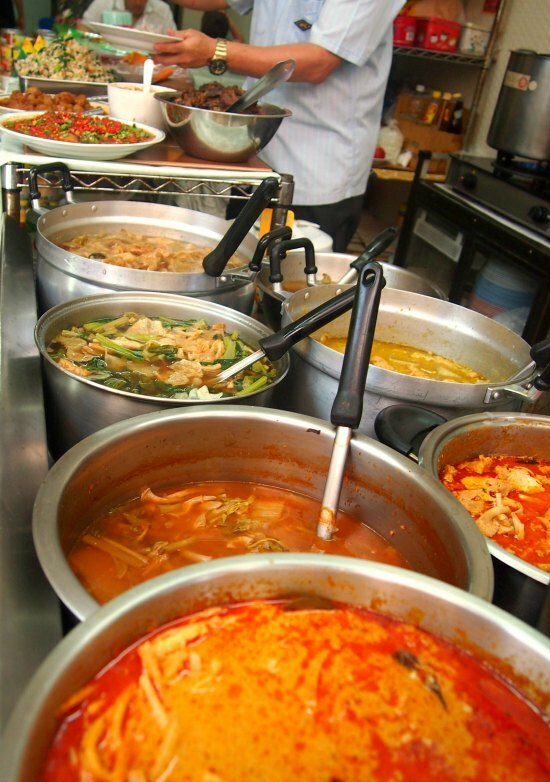 Don’t be affraid of small shops and street stalls selling ready-prepared dishes. The flavours are amazing and we’ve never been sick. The Thai people aren’t in the habit of giving their regilar customers food poisoning. It’s hard to stop eating when every market stall sells something delicious. Pork dumplings at Amphawa floating market. These are found in the major cities of Thailand and are either independent or part of the top hotels. The most famous is Nahm which was originally run by David Thompson but is now overseen by head chef Prin Polsuk. Serving up classic Thai food in a 5 star luxury setting the ethos here is about balance, authenticity and seasonal ingredients (in the right season of course). Not a cheap option by anybody’s standards but if you have the opportunity a must do. A tasty pork noodle soup from a tiny stall in rural Thailand. Pick your noodles, the vendor adds the cooked pork, pork balls and vegetables, ladeling in the pre-prepared stock. 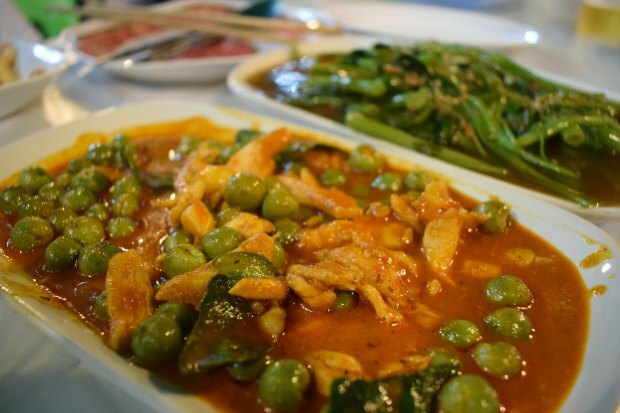 There is very little heat, that you add to taste at the table, along with your choice of peanuts, sugar, lime, fish sauce or other condiments. My personal favourite, street stalls as the name suggests are found on most street corners and offer the best value and flavour across Thailand. These are our usual haunt in Bangkok. Look out for where the local Thais eat. That is a sure sign its good. In the tourist areas the food is often toned down and lacks the same flavour and variety. A tiny mom and pop shop on the back streets of Bangkok, order rice, a curry or stir fry dish , add a fried egg or a fried pork cake, pay per item, eat on the plastic stools on the pavement. Delicious! Khoa San Road has numerous stalls selling Pad Thai but not much else unless you fancy deep-fried scorpion. A note on that is that in 20 years I’ve never seen a Thai person at one of these stalls. They are here for the tourist market. . Even going 2 streets from the tourist areas you’ll find brilliant food again. At the top end of Rambuttri Rd, the next street over from Khao San, there is a collection of pavement restaurants always busy with tourists. You can order quite a feast there for little cash. Morning Glory in Oyster sauce and a chicken red curry packed with tiny aubergines while sittng on plastic chairs, watching street life unfold. Not something most people would think of in Thailand but worth a visit if you’re out shopping all day. Bangkok has some brilliant food halls in the massive shopping centres like the MBK centre and Fifth Food avenue next door. Not serving the usual western fast food they have a variety of the local cuisine at a reasonable price. The picture below is of a food court in a new, modern mall in Chiang Mai. Sit yourself down on a mini-stool, order from the picture menu and have a dish of noodles or soup freshly prepared in front of your eyes. Prices are low, think around a pound or a dollar a plate, the food is good. Everything prepared and ready to make a delicious noodle soup, on a boat. Damnoen Saduak floating market, near Bangkok. There is a magic in watching the night markets set up in Thailand, every town will have at least one, bigger cities have dozens, all serve good food. But not all markets are night markets and some floating markets are ideal for morning, others for afternoons and evenings. Markets are my second favourite place to find great Thai food and where a lot of the locals will eat out while shopping. Each stall specialises in something different. Here Thai fish cake wrapped around various centres. 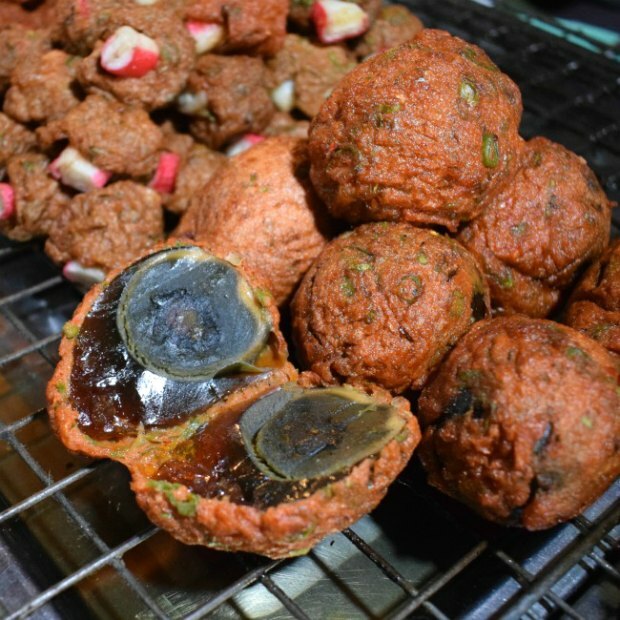 Century egg is delicious, but may scare off a few Westerners. 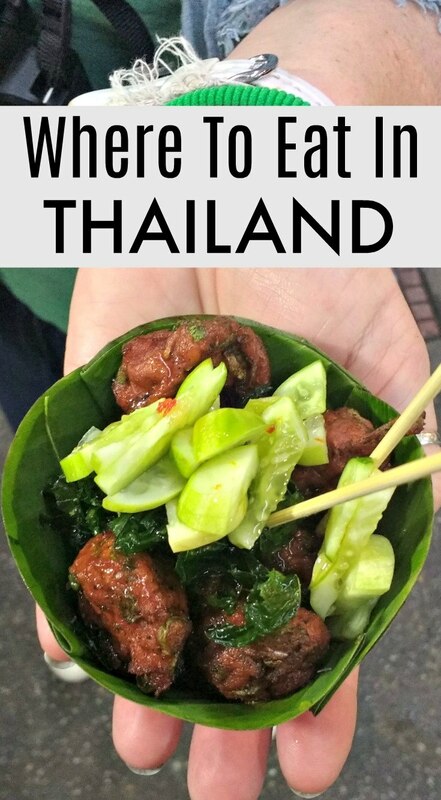 I’ve made this pin on Where to eat in Thailand if you’d like to pin it. 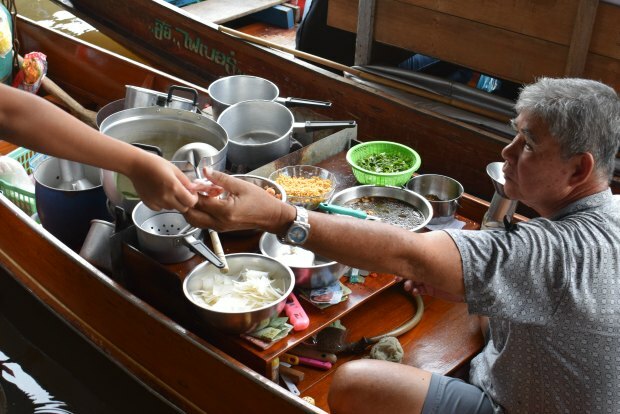 Some, like Amphawa, mentioned below, have such culinary klout and old world charm that they draw the domestic tourists too. Most markets have little restaurants attached. These might only be a few plastic table and chairs but don’t worry the food will be worth it. 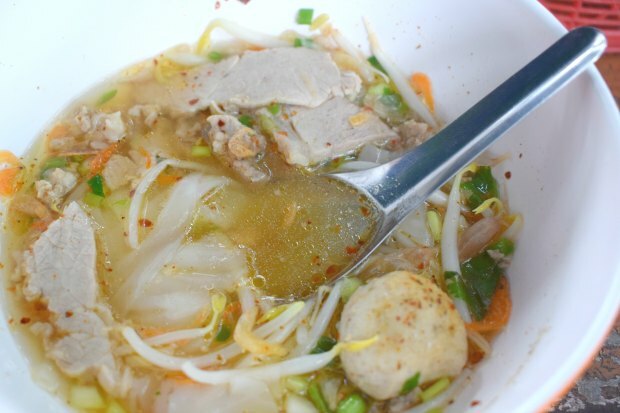 Even the big floating markets that the tourists will go to have delicious food, Damnoen Saduak, the morning market that Bangkok tours visit, has good pork noodle soup . Amphawa floating market specialises in local seafood and is alive with tasty treats of cheap food. You could easily get yourself a 4 course meal for under a fiver. The stalls are arranged across the market and you can just point and pay. 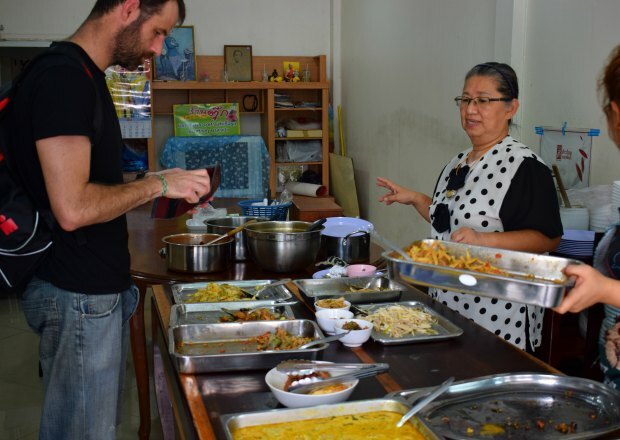 Most restaurants and stalls will have a menu in both Thai and English. Great tips. Thank you for sharing. I can`t wait to visit Thailand! Wow!! So interesting and pictures are amazing and look so attractive. Thanks for sharing. Ahhh, the floating markets look amazing as do all of your food photos. Thanks for sharing these tidbits!